Well gee maybe i'm wrong, i just view the BC - Washington and Oregon relationship stronger than the SW Ontario - Michigan/Up state NY relationship but idk maybe i'm wrong there too. Though I do think generally speaking for overall American retail penetration and just an American 'feeling' city in Canada - Toronto is probably tough to beat. Last edited by fusion2; 04-14-2014 at 09:07 PM..
Toronto is the only answer. Well maybe the smaller Canadian cities like Calgary, Edmonton, Windsor, Regina are probably even moreso. Van doesn't look like anything in the US. 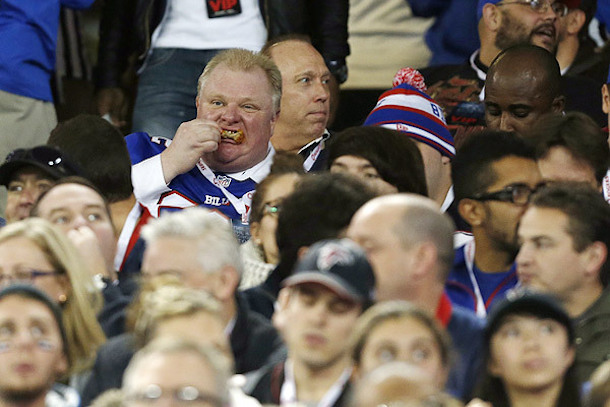 Yes that is Rob Ford eating wings at a Buffalo Bills Game in The Rogers Centre. If that doesn't seal the deal with you than nothing will ha. When has the Mayor of Vancouver or Calgary watched a NFL game eating wings, decked out in the home teams jersey actually in Vancouver or Calgary. Neva! Plus yes Buffalo is our home team... more than half the people at most Bills games at Ralph Wilson Stadium are from the GTA - well almost half haha I've done it a few times - good times too. Last edited by fusion2; 04-14-2014 at 09:21 PM.. In the 1970s, I thought Tel Aviv seemed very American, recalling the old ethnic neighborhoods of a city like Chicago. Also, Salisbury, Rhodesia, now known as Hararre, Zimbabwe. A lot of cities in Brazil look much like American cities. I think in this case, it's Washington and Oregon that feel more Canadian rather than BC feeling more American. You are right! Toronto has both a NBA Team - The Raptors and a MLB team, The Blue Jays. Montreal had the Expo's which was in MLB and Vancouver had an NBA team (Vancouver Grizzlies) but both folded due to financial and attendance issues. Toronto is the only market in Canada that has been able to maintain large scale U.S sports leagues on an ongoing basis. If there is a market in Canada that would get a NFL team it would be Toronto. There's been talk about the Bills moving here but I don't think that'll happen soon but a Toronto NFL team in the next decade or two isn't beyond the realm of possibility. What do you think is the world city with the most American feel?